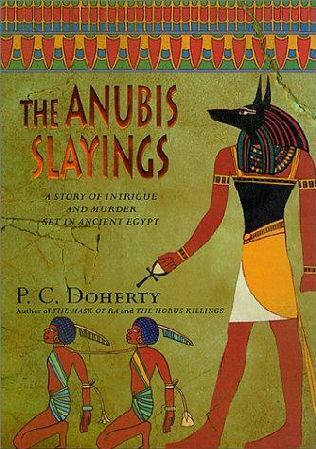 After a bit of a hiatus in terms of book reviews for the excellent EuroCrine website (as I'd read a lot of non-European crine novels over the past few months), I'm finally 'back on the horse', with my review of PC Doherty's THE ANUBIS SLAYINGS, being published this week. Paul (P C) Doherty is the author of several acclaimed historic mystery series, including the Sorrowful Mysteries of Brother Athelstan, the Hugh Corbett Medieval Mysteries, and the Canterbury Tales of Mystery and Murder. He has also written series set in the days of Ancient Rome and Alexander the Great. The history-loving headmaster has been prolific in his mystery writing (setting multiple series in many diverse moments and fascinating eras throughout history. Unlike many historical mystery authors, Doherty doesn't concentrate on one particular location and time period - instead researching and setting mystery tales in many. He has written more than 75 novels, under a variety of names. With the Ancient Egypt Mysteries, Doherty takes murder mysteries even further into the past than his medieval tales. Now up to seven books (Doherty has also written another three separate novels set in Ancient Egypt), the Ancient Egypt mysteries centre on the various investigations of Lord Amerotke, wise and trusted judge and adviser to powerful female Pharoah Hatusu. I was introduced to Doherty's Ancient Egypt Mysteries while travelling through Egypt earlier this year; in fact, I picked up a copy of THE ANUBIS SLAYINGS, the third book in the series, while visiting Luxor (the modern-day site of historic Thebes - one of the locations in the series). Read my full review on EuroCrime HERE. Craig - Thanks, as always, for your review. I confess I haven't read this one, but I have read some Doherty, and enjoyed what I have read. I'm going to have to put this one on my TBR list. I've seen Doherty's books around, but I've never read one. I enjoy historical mysteries, so I'll take a look at one. I very much enjoyed THE ANUBIS SLAYINGS - so, so, so much better than Christian Jacq's mystery novels similarly set in Ancient Egypt (I put down THE TREE OF LIFE about 50 pages in, and haven't got back to it yet, months later). Will definitely be trying to get my hands on more of these - and would be keen to try his other series too... certainly a prolific author.